Looking to Star Trek Into Darkness, The Hangover Part III, and Epic for inspiration, we've pulled together a selection of Marvel Universe movies, romances from literature, and crowd-pleasing comedies with underrated stars. Captain Kirk and the Enterprise crew are back to face a new threat to Starfleet, a mysterious terrorist played by Benedict Cumberbatch. Chris Pine, Zachary Quinto, and Zoe Saldana co-star. J. J. Abrams directs. 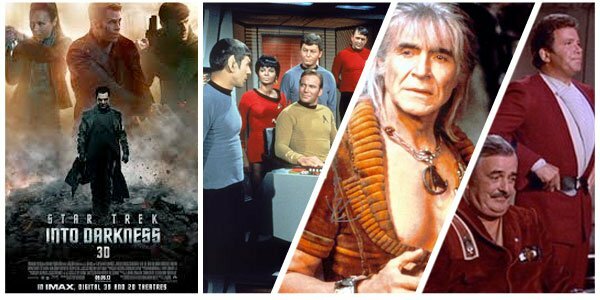 If Abrams' rebooted Star Trek is making you nostalgic for the originals, you can spend the whole of your Memorial Day Weekend revisiting the original series and two of its most popular spin-off movies. Star Trek (1966) Check out the series created by Gene Roddenberry that started it all! William Shatner stars as James T. Kirk, captain of a sprawling starship called Enterprise tasked with a five-year expedition into deep space, the final frontier. Accompanying him on his journey is the ever-logical first officer Spock (Leonard Nimoy), the oft-frustrated Dr. McCoy (DeForest Kelley), and the beautiful and brilliant communications officer Uhura (Nichelle Nichols). All three seasons are now streaming. Star Trek II: The Wrath of Khan (1982) The first Star Trek movie was roundly scorned, which may explain why it's not streaming. But its far more popular sequel is! Made sixteen years after the series' premiere, this space adventure has Kirk promoted to Admiral, a cushy job that's boring him to death. But when an old enemy resurfaces, Kirk and his ex-Enterprise crew reconvene to save the day! William Shatner, Leonard Nimoy and Ricardo Montalban co-star. Nicholas Meyer directs. Star Trek III: The Search for Spock (1984) Taking place shortly after Star Trek II, this sequel has Kirk and company spiraling from side effects of their treacherous brush with Khaaaaaaaaan! Kirk breaks Starfleet rules, faces off against pugilistic Kligons, and travels to an experimental Genesis Planet to save the sanity of one friend, and the life of another. William Shatner, George Takei and DeForest Kelley co-star; Leonard Nimoy directs. The Wolfpack is back. And this time they don't need a bachelor party to spur shocking shenanigans and maniacal mayhem. All they need is to be charged by a gangster—who kidnaps Doug of course—to find the wily Mr. Chow! Bradley Cooper, Ed Helms, and Zach Galifianakis star; Todd Phillips directs. If you want to fill your holiday weekend with comedies made for more "mature" audiences, try this trio of late night laffers. Whether its for wildly politically incorrect one-liners, outlandish sexual humor, or some deeply deranged protagonists, each of these titles well deserves their R-rating. Bachelorette (2012) Adapted by writer-director Leslye Headland from her play of the same name, this ballsy comedy is all about bridesmaids from hell. Kirsten Dunst stars as Regan a psychotic overachiever who is filled with rage when her overweight gal pal (Rebel Wilson) gets engaged, and makes her the maid of honor. Still, Regan tries to fulfill her wedding obligations to their fullest, even when a drug-fueled reunion with her party animal best friends (Lizzy Caplan and Isla Fisher) threatens to derail the bride's perfect day. Cocaine, strippers, and some real drama moments make this comedy even racier than The Hangover or Bridesmaids. Andrew Rannells, James Marsden, and Adam Scott co-star. The Dictator (2012) Sacha Baron Cohen leaves his pranking antics behind for this political satire that has him playing despotic General Aladeen, dictator of the Republic of Wadiya. 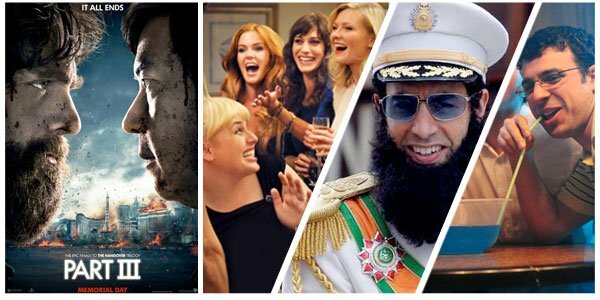 When an American operative strips this tyrant of his trademark beard and set him loose on the streets of New York City, Aladeen finds unexpected help from a kind-hearted co-op manager played by Anna Faris. But even she can't curb the insanity of the racist, sexist, megalomaniac despot. Ben Kingsley and Jason Mantzoukas co-star; Larry Charles directs. The Inbetweeners Movie (2011) A movie spinoff of the celebrated Britcom follows the show's four dopey friends on a summer vacation to Crete. Will, Jay, Neil, and Simon hope to have a debauchery filled getaway fueled by booze and sexual conquests. But a location change doesn't make these blokes any smoother with the ladies, and the results are hilarious. Not familiar with the show The Inbetweeners? Hilarious seasons one and two are now streaming. In this animated adventure, teen Mary Katherine steps out of her humdrum routine and into a world of magic and wonder when she's shrunk down and transported to a world that lies beneath our noses. Within the forest she finds a climatic battle is raging, and she must muster her strength to fight alongside her new friends to conquer an evil that could not only destroy their world, but also ours. Amanda Seyfried, Josh Hutcherson, Colin Farrell, Chritstoph Waltz and Aziz Ansari lend their voices. Chris Wedge directs. Looking for something that'll be fun for the whole family this weekend? How about three celebrated animations that center on brave kids confronting fantastical creatures? One's a Disney classic, another is one of 2012's most critically heralded cartoons, and the third is an emerging pop culture sensation. All of them are terrific, no matter your age. James and the Giant Peach (1996) Based on the beloved children's novel by Roald Dahl, this inventive adaptation blends live-action footage with stop-motion animation to tell the story of an orphan boy named James who dreamed of New York City. At the film's start, James is miserable living with his cruel aunts, Spiker and Sponge. But spilling a magic concoction onto the family's peach tree gives James an incredible way to make his way to the Big Apple, as well as some buggy companions to help him along his journey. Richard Dreyfuss, Susan Sarandon, David Thewlis, and Simon Callow lend their voices. Henry Selick directs. ParaNorman (2012) This original monster story from Laika Entertainment made appearances on many critics' top ten lists, and earned an Academy Award nod for Best Animated Feature. Its hero is a boy named Norman who has a bizarre ability to see and talk to the ghosts of the dead. This power makes him a total outcast until a witch's curse unleashes zombies on his hometown. Now it's up to Norman to uncover Blithe Hollow's past and save the day with the help of his motely monster-fighting crew. 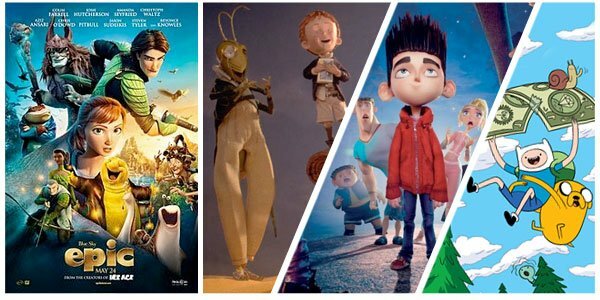 Kodi Smit-McPhee, Tucker Albrizzi, Anna Kendrick, Casey Affleck, and Christopher Mintz-Plasse lend their voices. Chris Butler and Sam Fell direct. Adventure Time (2010) This cartoon series created by Pendleton Ward has earned three primetime Emmy nominations as well as the love of critics, and fans young and old. The show centers on a human boy named Finn who lives in the magical land of Ooo, where he battles monsters, explores dungeons, and rescues princesses from the deranged Ice King, all with the help of his best friend, a magical dog named Jake. Kids will love the goofy humor and 11-minute long adventures. Adults will enjoy the whimsy and thought-provoking themes Finn encounters as he interacts with the scientifically brilliant Princess Bubblegum, the deeply shallow Lumpy Space Princess, the mischievous vampire queen Marceline, and more. Jeremy Shada and John DiMaggio star as the voices of Finn and Jake, but guest stars to date have included Maria Bamford, Ron Perlman, Neil Patrick Harris, Keith David, Cloris Leachman, Clancy Brown, Lou Ferrigno, Kristen Schaal, and George Takei. Season one is now streaming.